Church fund-raising cookbooks are generally compilations of recipes by the family and friends of the church-goers. But in the case of “The Bishop’s Bounty Cookbook: Food from Heaven that Tastes Divine,” the book highlights the life, accomplishments, and abundant recipes of the Bishop himself, The Most Reverend Charles Pascal Greco from the Diocese of Alexandria, Louisiana. I like to think that finding this old cookbook was a gift from above, since it has so many easy and delicious dishes in it, many of which are Father Greco’s authentic recipes. Throughout the chapters, you not only get great meal ideas, but also a glimpse into one life that accomplished many things. Father Greco, born in 1894, built churches, schools, camps, and even a ninety-six foot ship for “children to play and adults to sit and relax.” The Star of the Sea took five years to complete. But, more than anything, the Bishop loved to cook and share his recipes with anyone and everyone. I chose the Chinese Barbecued Ribs because it’s so simple and savory! It makes enough to load up a platter and share, a notion that I think Father Greco would find absolutely heavenly. In a medium bowl, whisk together the soy sauce, vinegar, Sherry, beef broth, sugar, honey, ginger, and garlic until well combined. Set aside one cup for basting when ready to cook ribs. Place racks of rib in a glass casserole or baking dish, meaty side down. Pour remainder of marinade over the ribs, cover and refrigerate overnight, making sure meat is soaking in marinade. When ready to roast, preheat oven to 350ºF. 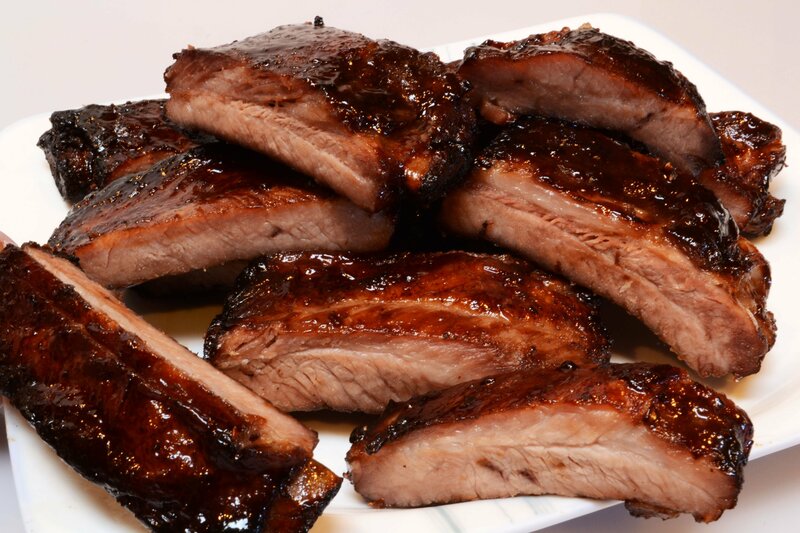 Place ribs on rack on a shallow baking pan or roasting pan lined with aluminum foil. Sprinkle ribs with pepper and salt. Discard marinade that ribs have been soaking in. Place ribs in center oven rack and roast for 1 hour. Baste with reserved 1 cup of marinade often (every 15 minutes or so.) After 1 hour, lightly cover ribs with foil and cook for another 20 minutes. Remove foil and cook for another 10 minutes or until ribs are done, basting several times. Ribs should be glossy and coated on the outside and succulent and moist on the inside.